Click here to read the Fellowship announcement on ARTnews! 2018 ABOG Fellows (clockwise from top left): Las Imaginistas, Miguel Luciano, Gregory Sale, Jordan Weber, Rachel G. Barnard, Our Mothers’ Kitchens, Brian Harnetty, and Melanie Crean. A Blade of Grass is pleased to announce our 2018 cohort of ABOG Fellows for Socially Engaged Art! Artists Rachel G. Barnard, Melanie Crean, Brian Harnetty, Miguel Luciano, Gregory Sale, Jordan Weber, and collectives Las Imaginistas and Our Mothers’ Kitchens will join a growing body of artists and artist collectives that A Blade of Grass collaborates with and directly supports. At the core of the program is the ongoing goal to build a body of field research, films, publications, public programs and web content that highlight the expanding practice of socially engaged art at the intersection of art and social change. The 2018 Fellows will realize projects in Brownsville, Texas; Hartford, Connecticut; the San Francisco bay area; Shawnee, Ohio; Omaha, Nebraska; Philadelphia, and New York City, where they will be exploring issues of criminal justice reform, history preservation, food justice, gentrification, and environmental and racial justice, among others. The final eight projects were chosen by two selection committees from an initial pool of 476 domestic and international applicants. 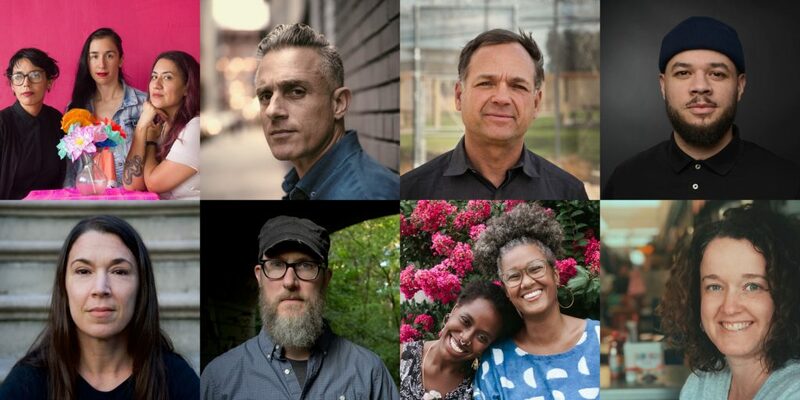 These applicants were selected as leading examples of artists engaging community members as equal partners in ambitious and creative collaboration. Artist RACHEL G. BARNARD will create The Fair, a project focused on fostering transformational relationships between Department of Probation officers and clients, as part of the 2018 NYC Department of Cultural Affairs’ Public Artist in Residence (PAIR) program. Barnard will develop a series of concrete interventions in collaboration with the DOP community, to be staged across all five boroughs. Interventions will restructure moments of human connection and promote a shared sense of belonging between the groups. Learn more. Artist MELANIE CREAN will create No Such Place as America, a collaboration between Patricia E. Kelly, Founding President / CEO of Ebony Horsewomen in Hartford, Connecticut; members of the Hartford Police Department; and local high school students. This team will use equine therapy and participatory narrative techniques to form a new shared, non-verbal, creative vocabulary to increase trust and foster mutual understanding between the police and students. The project’s transdisciplinary methods will be documented in order to be borrowed and reproduced in other communities. Learn more. Musician BRIAN HARNETTY will create Fracked Forest Listening Rooms near the town of Shawnee in rural Appalachian Ohio, inviting local community members including miners and construction workers to gather and critically listen to various outdoor spaces in the Wayne National Forest, an environmental site at risk of fracking. Participants will hear soundscapes created from archival recordings of local oral histories layered over the natural sounds of the forest. After the listening session, participants will share their own experiences, hopes, and fears. These stories will be recorded and remixed into future sessions, creating a continually expanding sonic map of the forest’s past and present. Harnetty is the 2018 ABOG Fellow for Contemplative Practice, in partnership with Hemera Foundation. Learn more. Artist MIGUEL LUCIANO is creating Island/Inland PROMESAS, a project that explores stories of resistance and resilience within the Puerto Rican community during times of crisis, from the post-civil rights era to the post-Hurricane Maria present. The project is centered in East Harlem and anchored around a series of billboards and projections placed by the artist. The billboards and projections deploy historical documentary photographs of actions done by the Young Lords, a Puerto Rican activist organization founded in the late 1960s. Each billboard or projection image will depict a historical event, and will be sited where the actual event took place. Walking tours, intergenerational community workshops, and other programming will simultaneously honor the activist history of East Harlem and examine the current plight in Puerto Rico, with a goal of activating new strategies to aid a community in desperate need. Learn more. In collaboration with individuals honing their ability to succeed after incarceration, artist GREGORY SALE is developing Future IDs at Alcatraz. Project participants create ID-inspired artworks to portray their own visions of their future selves in contrast to their prison-issued IDs. Future IDs comprises a year-long exhibition, workshops, and public programs across California, developed in partnership with the Los Angeles-based Anti-Recidivism Coalition (ARC). Sale is the 2018 ABOG-David Rockefeller Fund Joint Fellow in Criminal Justice. Learn more. Artist JORDAN WEBER will create 4MX Greenhouse (4 Malcolm X Greenhouse), a sculptural and programmatic artwork built on a philosophy of four pillars of health: Malcolm X’s legacy of self-empowerment and determination; soil and air cleansing; spiritual reflection and meditation; and medicinal and food supply. A greenhouse in the shape of Malcolm X’s birth house will be built on his birth site in North Omaha, a neighborhood with a history of poverty and social and economic challenges defined by racial boundaries and food desert status. The greenhouse will produce food crops and act as the site of spiritual practice and other community-based programming. Learn more. Working collectively as OUR MOTHERS’ KITCHENS, Khaliah D. Pitts and Shivon Love will host a series of community dinners of the same name, each focused on a Black female writer. The dinners will create a space in which participants can connect to a lineage of literature and food from the African diaspora, reclaiming and affirming cultural influences and celebrating ancestry and memory. Learn more. Working collectively as LAS IMAGINISTAS, Christina Patiño Houle, Celeste De Luna, and Nansi Guevara will facilitate Hacemos La Ciudad (We Make the City), a multi-phase project that will examine how state and federal militarization initiatives in Brownsville, at the US-Mexico border, have impacted urban development and civic art. The artist cooperative will collaborate with local scholars and residents to hold planning sessions and performative movement workshops, developing a new Plan de Arte Cívica del Pueblo Entero (Civic Art Plan of the People) for Brownsville. Learn more. A Blade of Grass is committed to presenting stories about artists working as creative change makers. In an effort to highlight the expanding practice of socially engaged art and to expand how this type of work is supported, the selected projects become the focus of ABOG’s free public programming, field research, short documentary films, and print and web-based content. To support their projects, each ABOG Fellow will receive an unrestricted stipend of $20,000. To nurture this growing movement of artists working as creative change makers in communities, A Blade of Grass is proud to work in partnership with David Rockefeller Fund and Hemera Foundation on issue-based fellowships. Now in its third year, the ABOG-David Rockefeller Fund Joint Fellowship in Criminal Justice examines the transformational roles artists play in a criminal justice context. In partnership with Hemera Foundation, the ABOG Fellowship for Contemplative Practice is now in its second year and supports artists who work at the intersection of social practice and contemplative practice. The ABOG Fellowship for Socially Engaged Art is made possible through the generous support of over 100 individual contributors and foundation and government partners. We are grateful for major contributions from David Rockefeller Fund, Hemera Foundation, National Endowment for the Arts, Rockefeller Philanthropy Advisors, and Groundbreakers Agnes Gund, Eva Haller, Shelley Frost Rubin, and Linda Schejola. Related public programs are supported in part by public funds from the New York City Department of Cultural Affairs in partnership with the City Council; the American Chai Trust; and the New York State Council on the Arts with the support of Governor Andrew M. Cuomo and the New York State Legislature. To learn more about A Blade of Grass and the artists we work with, please visit: www.abladeofgrass.org. Join the conversation with A Blade of Grass on Facebook (A Blade of Grass), Twitter (@abladeofgrass) and Instagram (@abladeofgrassnyc) and via the hashtag #ABOGFellows. Photo credits (clockwise, from top left): Las Imaginistas / Photo: Christina Patiño Houle. Miguel Luciano / Photo: Ryan Redcorn. Gregory Sale / Photo: Brandon Ng. Jordan Weber / Photo: Michael Watson. Rachel G. Barnard / Photo: courtesy the artist. Our Mothers’ Kitchens / Photo: Adachi Pimental. Brian Harnetty / Photo: Kevin Davison. Melanie Crean / Photo: Jordan Parnass.